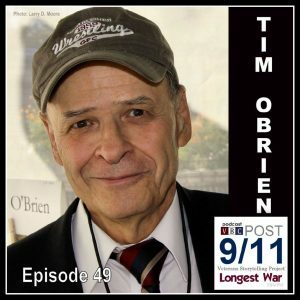 On episode 49 of Longest War: The Post-9/11 Veterans Podcast, we talk to Vietnam veteran and noted author Tim O’Brien about memory and truth in war, making sense of absolutes, and how veterans can deal with experience through writing and storytelling. O’Brien is the author of several works related to the war, including Box Me Up and Ship Me Home, If I Die in a Combat Zone, and Going After Cacciato, which won the National Book Award for Fiction. He has appeared in numerous documentaries about Vietnam, including Ken Burns’ 2017 series, The Vietnam War. This episode was recorded May 22, 2018 in Pittsburgh, Pennsylvania. Host: Nick Grimes. Guest: Tim O’Brien. Audiography: Kevin Farkas/The Social Voice Project. Music (available on SoundCloud.com): Standingwave Master (“101814 traditionalkoreandrumdance”), Alexander White (“Warm It Up”), Jonathan Nield (“Get Them Out”). Other sounds (available on YouTube.com: President Lyndon B. Johnson (“Why We Are in Vietnam”), Movieclips (“Thou Shall Not Kill,” from the movie Born on the Fourth of July (1989, Universal Pictures). Cover photo: © 2012 Larry D. Moore (CC BY-SA 3.0). ©Longest War: The Post-9/11 Veterans Podcast. Veterans Breakfast Club. All rights reserved.